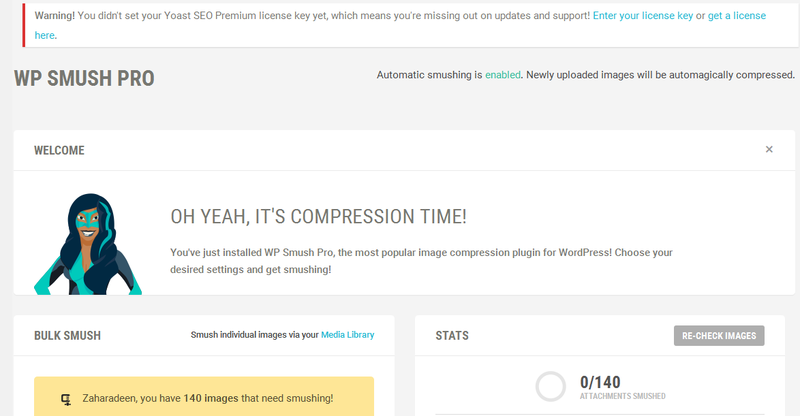 The fastest, easiest and best performing image compression plugin for WordPress . So IN This Post I Teach You How To Turn Your Free WP Smush Plugin To Pro Version! 7/ This function returns false, so change to true. Thats All!!! IF You Happy Please Like This Post! Tried this one out and changed to “TRUE” as instructed but nothing happens. WP SMUSH is still the free version and not WP SMUSH PRO.. Any ideas? Hi Darryl Whats Up ? Clear your website cache it works 100%. You get to bulk smush, but none of the other pro features actually work as they’re handled on the API/server site. hi my dear freind .babak.this whay not working wth updating wp smush to new 2.2.1 version…… so yo can put the erliest version (2.2.0) in this post. ey vay rast migia 😀 aslan havasam nabood …faghat ye chizi babak jan… nemishe oon wpdiscus emoticon ke hgablan behet goftam null beshe??? Thanks a lot for this. It just worked. Lol man, you is terrible hahaha, working perfetly! Thanks from Brasil! You are genius! perfectly good job! It is able to do in other wpmudev plugins? Folks its really amazing . Dont know what to say about the plugin auther,is he dumb or he’s great enough to built this awsome plugin. Guys this step is really works . I am having around 200,000 images on my website and i am using a pro version now. all images are smushing with only one click. Hats of to you man .!! But you’re not though, this gets you access to bulk smush, not smush pro. You don’t get all the premium features this way. ha, ha! How can i use Super-Smush ? Sorry but it not work with me. When Run it say PRO but i can’t use super smush + Smush image 3mb . Can you help me Admin ? Hahaha.. Ultimate trick! you made my day. Thanks! Worked for me. For any deal/Offer.. Please visit us. That Was SUPER AWESOME…. LOVE YOU. It looks like Smush couldn’t verify your WPMU DEV membership so Pro features like Super-Smush may not work correctly. If you think this is an error, run a re-check or get in touch with our support team. Please, could you help with this? getting this error: It looks like Smush couldn’t verify your WPMU DEV membership so Pro features like Super-Smush may not work correctly. If you think this is an error, run a re-check or get in touch with our support team. Also getting this error: It looks like Smush couldn’t verify your WPMU DEV membership so Pro features like Super-Smush may not work correctly. If you think this is an error, run a re-check or get in touch with our support team. It works with latest 2.4.5 version. Just deactivate the plugin and activate it again after doing the procedure. I spoke too soon. The super-smashed fails after a while. Not working with latest version as of yet. Go through the code and delete the url for api check and turn off revalidate it won’t bring errors anymore. Did you find a solution? I have been playing with the code with no sucess. Very good mate. Keep it up 😉 God bless you. getting the same msg ! I tried installing it on Cpanel but also no luck.. I tried those step you mention.. still not working ..
Is this trick still working? Really thank u so much. This Code is Not Working Well ! i use this code and work well. I put the file with the code online so that you can replace the original. This sounds stupid, but it works. What kind of protection is this?? LOL. Thank you, work for me! I receive this message as well: It looks like Smush couldn’t verify your WPMU DEV membership so Pro features have been disabled for now. If you think this is an error, run a re-check or get in touch with our support team. However, the super smush stiil works even though I am seeing those message. It’s quite odd though. Thank you so much bro. It is working. This way it will be unlimited and will not stop at 50 images. for new version it’s not working, do you have any new way to solve it?